A panel discussion was held today at the EU Info Centre in Belgrade under the title ‘EU Elections and the Enlargement Process’, with the attendance of Acting Assistant Minister of European Integration Ksenija Milenković, Head of the Brussels Office of the German Institute for International and Security Affairs based in Berlin Dušan Reljić and Secretary General of the European Movement in Serbia Suzana Grubjesić. 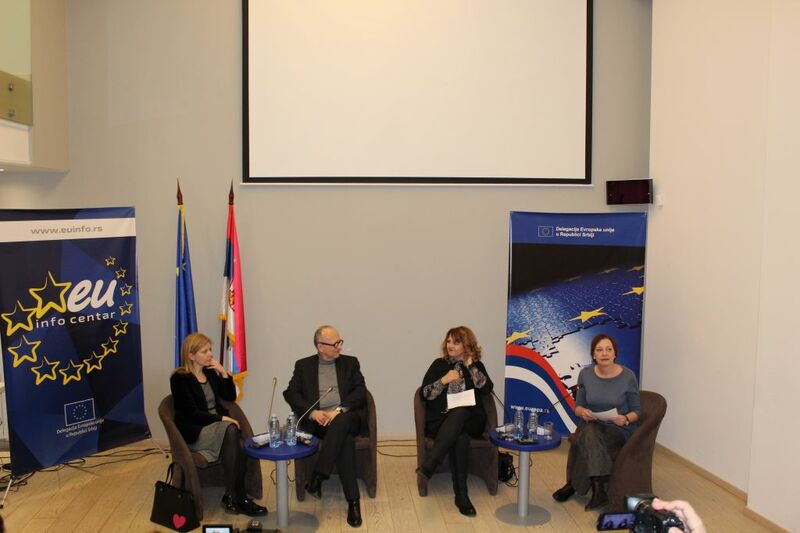 Some of the questions posed during the discussion regarded the importance of European Parliament elections in May 2019, the influence of the new composition of European institutions on the EU's enlargement policy towards the Western Balkans, and the level of EU interest in the region and Serbia after these elections. Ksenija Milenković stressed that the elections in the EU were one of the most important topics of the year regarding European integration. “Regardless of the fact that Serbia as a candidate country only has the status of observer and as a candidate country it does not have a lot of influence, both on the outcome and on the flow of campaigns and the elections themselves, it is of utmost importance for us to see what political context will prevail in the European Union as of June. This is significant both for the enlargement policy and for all other EU policies”, stated Milenković. When asked about changes expected after these elections, Ksenija Milenković stressed that according to all available estimates, no drastic shifts were expected in the balance of power within the European Parliament, while traditional political groups were expected to retain a majority. She added that estimates show that certain new forces that would not be insignificant and whose voice would be able to influence EU policy in the future would win seats. The panellists emphasised that the EU would certainly not show a lack of interest in the region after the May elections, given that this was the only region with a promised European perspective, that the EU would not give up on its enlargement policy, but also that the European Union must find a way to promote the policy of admitting new members to the European community among its citizens.